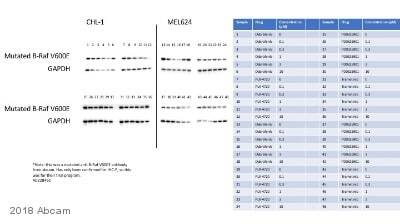 The VE1 monoclonal is a sensitive and specific antibody that detects mutated, constitutively active BRAF protein where glutamic acid is present at codon 600 instead of valine (V600E) (PubMed IDs: 21638088, 23657789). Synthetic peptide within Human BRAF aa 550-650 (mutated V600 E). The exact sequence is proprietary. IHC-P: Human colon carcinoma tissue with B-RAF V600E mutation. The V600E activating mutation in BRAF is found in several cancer types including: ~65% of pleomorphic xanthoastrocytomas, ~50% of melanomas, ~35% of papillary thyroid carcinomas and ~5% of microsatellite-stable colon cancers (PubMed IDs: 21274720, 24508103, 18682506, 16024606). The majority (>90%) of BRAF mutant cancers harbor the V600E mutation. The mutation leads to activation of the MAPK signaling pathway that increases cell invasion and reduces apoptosis. It also leads to reduced expression of melanocyte differentiation antigens and subsequent immune evasion (PubMed IDs: 21638088, 20551059). The VE1 monoclonal antibody is manufactured by Abcam. If you require a particular buffer formulation or a particular conjugate for your experiments, please contact orders@abcam.com. Our Abpromise guarantee covers the use of ab228461 in the following tested applications. Samples from human tumor tissues that were Positive (A, E, I) and Negative (B, F, J) for BRAF expression. Boxes in A, E, I show the negative controls from their corresponding non-tumor tissues. IHC for BRAF protein expression was performed on 4 μm-thick sections of formalin-fixed, paraffin-embedded tissues, using ab228461. The specimens were fixed in 10% neutral buffered formalin for 24–48 hours. after deparaffinization, the slides were pretreated with cell conditioning 1 for 64 minutes for antigen unmasking and followed by pre-primary antibody peroxidase inhibition. The slides were then incubated with the VE1 antibody at 37°C for 16 minutes, and counterstained with hematoxylin II for 4 minutes and bluing reagent for 4 minutes. BRAF (mutated V600E) VE1 immunoreactivity in melanoma sections: (A) strongly positive homogeneous staining, (B) moderately positive homogeneous staining, (C) weakly positive homogeneous staining and (D) negative staining of a patients biopsy that was identified as BRAF (mutated V600D). Sections were stained with undiluted ab228461. pre-treated with cell conditioner 1 (pH 8) for 60 min, followed by incubation with ab228461 at 37 °C for 32 min. Counterstained with one drop of haematoxylin for 4 min and one drop of bluing reagent for 4 min. (A) Positive staining in a V600E2-mutated melanoma sample of patient 8 (homogenous brown colour indicating mutated cells) with ab228461 and (B) negative control. BRAF V600E IHC positive PXA cases molecularly confirmed as BRAF V600E mutant tumors: strong granular cytoplasmic immunostaining of a characteristic pleomorphic multinucleated giant tumor cell (A), weak granular cytoplasmic immunostaining of pleomorphic and spindle tumor cells (B), strong granular cytoplasmic immunostaining of a cluster of isolated tumor cells (C). Four-micron freshly cut sections (<2 weeks) of formalin-fixed, paraffin-embedded (FFPE) tissue from human were dried and melted at 62°C oven for 20 minutes. Subsequently, they were stained with ab228461. Staining was performed on the Ventana BenchMark XT (Ventana Medical Systems Inc.). The staining protocol included online deparaffinization, HIER (Heat Induced Epitope Retrieval) with Ventana Cell Conditioning 1 for 32 minutes and primary antibody incubation for 32 minutes at 37°C. BRAF V600E mutations in adamantinomatous craniopharyngioma. Two cases are shown (a–e and f–j). a, f Classical features of aCP (wet keratin, stellate reticulum, palisaded epithelium). b, g Translocation of β-catenin is shown in both cases (brown reaction product). c, h An antibody to BRAF V600E (VE1) shows staining of the tumour tissue (brown reaction product). Immunohistochemical analysis was performed on 4µm sections from FFPE tumour specimens. Following dewaxing through graded alcohols, endogenous peroxidase activity was blocked (3% (v/v) H2O2 in PBS, pH 7.3, 20 minutes with orbital shaking). Epitope retrieval was achieved by autoclaving in sodium citrate (10mM, pH 6.0, 10 minutes) (β-catenin) or Tris-EDTA (10mM Tris base, 1mM EDTA, pH 9.0, 10 minutes) (BRAF). Sections were blocked with serum block for 15 minutes, then incubated overnight at 4°C with primary antibody diluted in PBS or TBS-T (1:1000 in PBS (β-catenin); 1:50 in TBS-T (BRAF)). Representative photomicrographs serially stained for hematoxylin and eosin, PMS2 and BRAFV600E of (a) DNA mismatch repair-proficient/BRAF wild-type colorectal carcinoma and (b) DNA mismatch repair-proficient/BRAFV600E mutant tumor. The slides were dewaxed in Bond Dewax solution and hydrated in Bond Wash solution. Heat-induced epitope retrieval was performed for 60 min in the manufacturer’s alkaline retrieval solution ER2. Slides were then incubated with the primary antibody at a dilution of 1 in 80 for 30 min at room temperature. Antibody detection was performed using the biotin-free Bond Polymer Defined Detection System. Slides were then counterstained with hematoxylin. Formalin-fixed, paraffin-embedded human colon carcinoma tissue stained for B Raf (mutated V600E) using ab228461 at a 1/100 dilution in immunohistochemical analysis. Publishing research using ab228461? Please let us know so that we can cite the reference in this datasheet.